TileCraft Blog - TileCraft, Inc. Which Should I Use and Where? Granite- Granite is striking, functional, and durable. These traits make granite ideal for kitchen countertops, accent islands, bar tops, and dining tables. Marble Special Precautions: Marble isn’t quite as worry-free as granite. It has a softer, less stain-resistant surface than granite and should be treated like a fine piece of wood. Spills should be wiped up immediately, coasters should be used under beverages to avoid staining and etching. Marble is especially susceptible to damage from citric acids, alcohols, and oils. Marble needs to be sealed before use in wet areas. Marble can stain easily from iron deposits in the water. Granite Special Precautions: Granite is a mostly worry-free surface, requiring few special precautions. It is extremely durable, stain resistant, and easy to care for. It won’t chip, crack, or scratch under normal use. Granite should also be sealed to ensure the quality and life span of the stone. Both: Routine maintenance should include dry dusting with a soft cloth as needed. Sealant will need to be reapplied as it wears down over time. Use specific stone cleaners that do not include acid or bleach. Miracle Sealants Company has a product called Tile & Stone Cleaner concentrate that is recommended as a daily cleaning product for marble and granite surfaces. Large format tiles are continuing to be in high demand. Sizes such as 24″ x 48″, 18″ x 36″, and 24″ x 24″ can be found with cement, wood, and textile looks, as well as, patterned tile. According to Eddie Bedrosian, marketing director for the company Bedrosians , “Porcelain slabs allow consumers to achieve the look of timeless stone and contemporary design with durable, large porcelain panels.” Another great design aspect of large format tiles is the smaller amount of grout lines. As more tile installers become familiar with the installation process of the large format tiles, the more you will see this trend in commercial spaces, as well as, residential homes. “Pattern packs a heavy punch when it comes to design, so it may work better as an accent wall, rather than an entire room. Since it will be on the wall for decades to come, it’s best to choose a style and color scheme you know you enjoy verses something novel you’ve recently discovered.” –Snipet from the article Sales Trends for 2018 by Louis Iannaco of the NTCA Trends magazine. 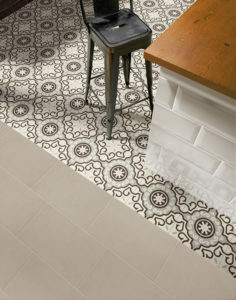 Patterned tiles are emerging as the new “it” tile. The styles vary from geometric and modern, to vintage and old world patterns. Every look is different and unique. 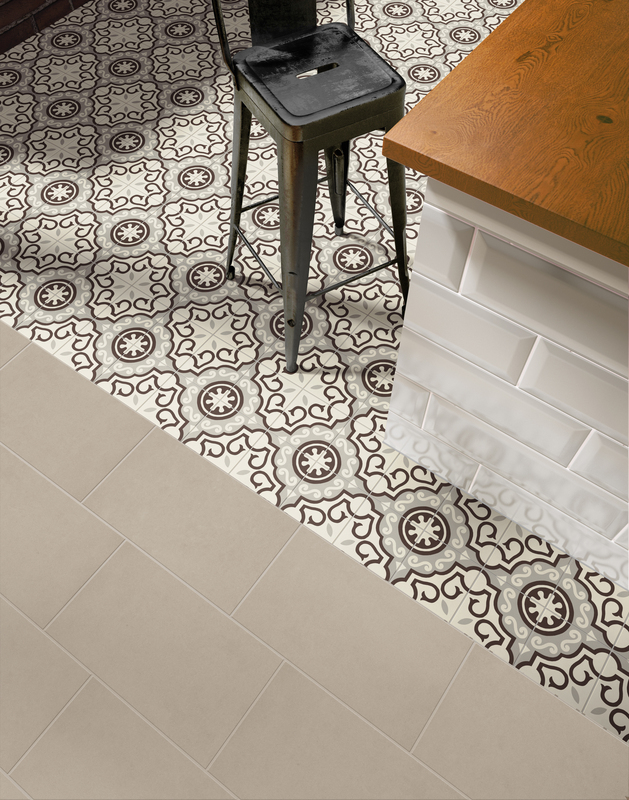 A popular use of pattern tiles is to create a “rug” on the floor by using the pattern tiles in the center of the room with solid colored tiles around the edge. 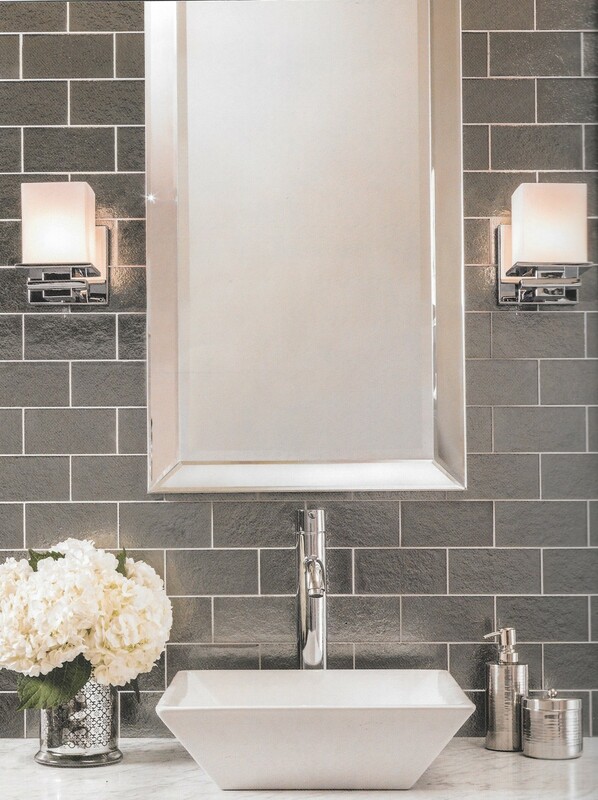 Another area that you can see pattern tiles would be as an accent on shower walls. We get many customers asking “Is the wood look tile going to stick around?” The answer is a resounding yes! Some distributors are saying that wood look tile accounts for 30%-40% of their total tile sales. With ink-jet technology, wood look tile designs are evolving to create richer grains, bold colors, and vintage etching effects. Typical plank sizes include 6″ x 36″, 8″ x 48″, and so on. Wood look tile is a beautiful, cost effective, and easy to maintain option when designing a “wood” floor. Warm Neutrals – taupe, cream, greige, and off white are go-to colors for any space. Dark Navy Blue – provides a calm and soothing dark neutral or accent color. Earth Tones – soft shades of grey and beige create a spa or rejuvenating feeling. Bright Kitchen Colors – expect a rise in bold color kitchen accents, richer and warmer color cabinets, rugs, accents and patterned tiles on walls and backsplashes. Black Matte – bold, contemporary look that complements a variety of materials and styles. Blue and Soft Greens – typically seen in glass mosaics and accent tiles. Metallic Finishes – create captivating effects when mixed with materials and textures. Terrazzo is typically view as “competition” in the tile industry, however, with ink-jet technology manufacturers can now produce porcelain tile with the look of real poured terrazzo. The visual of the mixed product modeling embedded marble, granite, quartz, or glass chip provides a unique look. This trend is starting to pick up steam in many areas of design. Tile Edge Protection – Is It Important? What is Tile Edge Protection? Protect tile edges from chipping. Provide easy transitions between adjacent floor and wall surfaces. Deliver a design element that is often ignored. Is Tile Edge Protection Important? If you want your tile design to look flawless for many years, then you will want to protect the edges of your tile. Once chipped or cracked, tile flaws tend to stand out. Having tile edge protection will protect the tiles from damage and create a finished, clean look. A knowledgeable installer, salesperson, or designer should discuss tile edge protection before installation begins. Many tile collections do not have matching trim or edge pieces, so you will want to find an alternative before installation. Where Do I Need Tile Edge Protection? Floor transitions from tile to carpet or tile to hardwood. 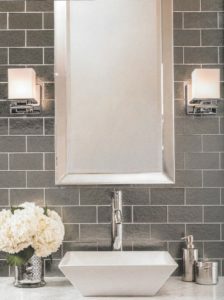 Shower jambs or shower walls where the tile ends. Edges around a recess or niche. Unfinished edges of a backsplash. Wherever you will see an unfinished tile edge (walls, trim, decoration, etc). The National Tile Contractors Association is celebrating its 70th anniversary in September 2017. The NTCA is a nonprofit trade association dedicated to the professional installation of ceramic tile and natural stone. It is widely recognized as the largest and most respected tile contractors association in the world. The NTCA provides industry support through trade education and training, as well as, service to members with technical assistance and advice. 1950s- The Southern Tile Contractors Association was established and the first director, Homer Panter, was hired. Annual conventions and local zone meetings were held focusing on member growth. 1970s- Joe Tarver became the executive director and education became the one of the association’s main components. 1980s- In 1985, the association changed its name to the Association of Tile, Terrazzo, Marble Contractors and Affiliates to make a clear statement that it was a national association, and actually made that official with the National Tile Contractors Association name being approved in 1988. The NTCA Workshop, a traveling educational road show and the NTCA Reference Manual were developed. In 1987, NTCA, along with the Ceramic Tile Distributors Association and the Tile Council of America formed the Tile Expo show, which is now known as Coverings. 1990s- The NTCA was able to grow its influence with support from volunteer leaders and the name of the Tile and Stone Exposition was officially changed to Coverings. 2000s- Bart Bettiga became the NTCA executive director and additional staff in education, training, and association management were hired. Association volunteer leaders helped the NTCA to grow from 400 members to 1,000 members by the end of the decade. Credentialing and certification became a driving force at the end of the decade. Programs like the Certified Tile Installer program were implemented. 2010s- Since 2010 the Association has experience significant member growth expecting to pass 1,400 members at the end of 2017. Also, the NTCA added annual TRENDS and TECH issues to its 13 annual issues of TileLetter. More programs were developed, such as, The State Ambassador network, The Five Star Program, Apprenticeship Program, and more. 2017- The NTCA celebrates the past 70 years as the leading tile industry association. Information provided by TileLetter September 2017 issue and the NTCA website www.tile-assn.com. White – evokes a sense of crisp and clean, all white kitchens and bathrooms are still in style. Black- classic pairing with white, staple of both modern and classic combinations- expect black and white marbles used in checkerboard patterns. Greige- grays have reigned for more than five years and warmed-up grays will remain an important neutral. Sensitive Blue- calming, soft blue, balanced, comfortable and casual like an old pair of faded jeans. Relaxing Cloud- this color trend is restful and calming, with cool, minimalistic influences that are derived from nature. Found in Scandinavian design. Metallic Taupe- medium brown undertones, taupe inspired metallic that is bold, rich, warm. Growing out of the popularity of rose gold. Pottery- mid-range red-browns that bring warmth of nature and earth. Creates cozy, comfortables atmospheres and rooms. Vintage Reserve- like deep red wine, this color is rich, bold, and pleasing to the palate, incorporating red/blue/brown hues. Organic Olive- a color that evokes a hope for the future, green is growth. Balance between light and dark hues. Victorian Plum- dark, strong, solid, a rich hue of velvet and pairs well with lace. Cement tile surfaces should be cleaned, free of grease, oil, dirt, wax or any other foreign matter including grout release material. Next, apply a high quality penetrating sealer for cement and concrete tiles and carefully follow the sealer manufacturer’s instructions. Sealing the cement tiles will insure the color and design will remain unstained and vibrant. Do NOT use any acids or alkalines to clean tiles. Use a PH neutral cleaner and fine sandpaper to remove any stains or residues. Do not allow water or other liquids to spot, pond, or ring on the surface of the tiles. Regularly mop cement tiles with clean water. To improve the tiles natural sheen, a cap-full of liquid wax can be added to the water. Never use acids to clean the tiles because they will damage it. 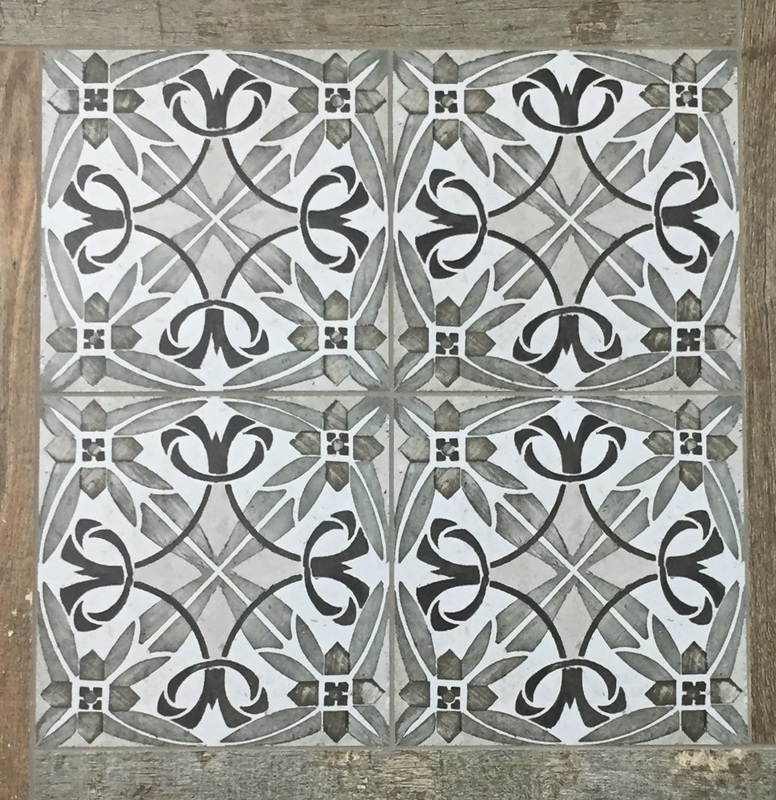 Cement tiles are manufactured using natural materials, so it possible that there could be color differences between the original order and tiles ordered at a later date. Carefully calculate how many pieces you will need and then order a few extra pieces. 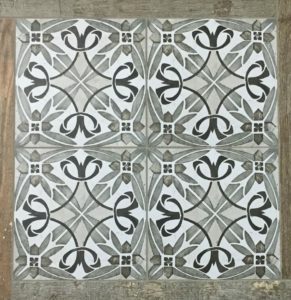 Keep these guidelines in mind when planning to use cement tile in your home. Coverings is the annual international trade fair and expo dedicated to showcasing the newest in ceramic tile and natural stone. This year it was held in Orlando, Florida. Coverings will be filled with seemingly endless rows of exhibits, displaying the newest in aesthetics and technology in both the stone and tile industries. In a collaborative effort between leading designers and contractors, “tiny” houses will be built on the show floor. The live-action demonstration and exhibit will feature three tiny homes being installed with tile over the course of the show by master installers. These homes will incorporate material from industry-leading tile and stone manufacturers. “The Installation Design Showcase is continually praised by show attendees for exemplifying design trends and the importance of proper installation techniques,” said Alena Capra, Coverings’ Industry Ambassador. Materials sponsored by Ceramics of Italy, Crossville, Florim USA, Ardex, Laticrete, and Mapei will be used for the project. Complementing the exhibition floor will be an extensive education program, including 70+ seminars on a diverse range of topics to meet everyone’s interests and area of expertise. Coverings will provide cutting-edge sessions which are free of charge to both attendees and exhibitors. 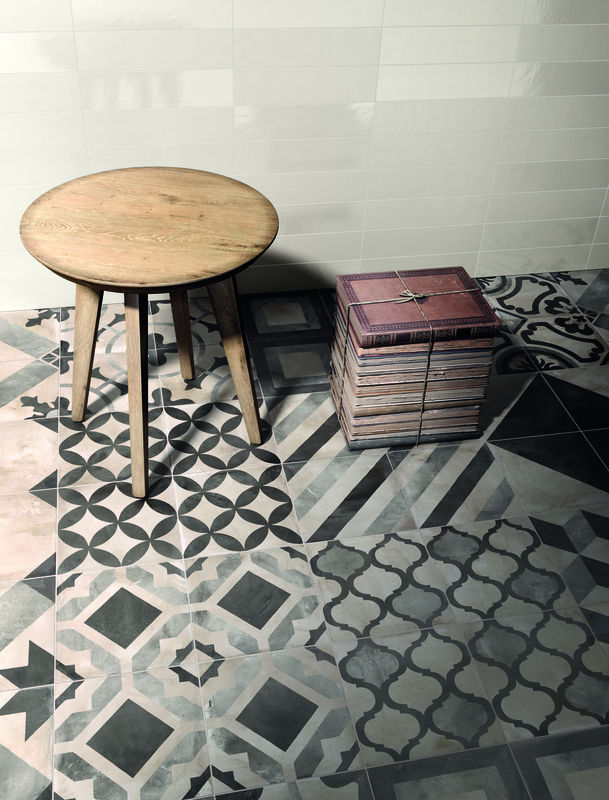 Natural materials are the main inspiration for tile patterns and designs for 2017. 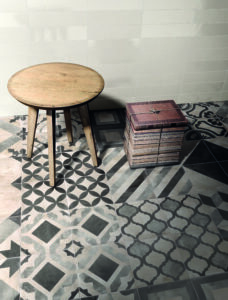 Tile trends including wood, stone, and cement tiles are only becoming more realistic and textured with time. Also, decorations, graphics, and textures are in high demand. 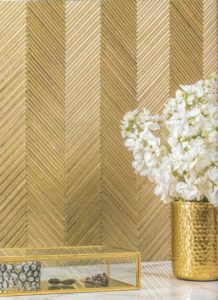 A trend we are noticing is the textile look- patterns that look like linens, fabrics, carpets- something you could just reach out and touch. Metallic looks are also gaining popularity. Shown below is a new collection from AKDO called Textile Glass. Golds, silvers, and dark gray metallic colors make up this stand out collection.